After the death of Henry Chaveney in 1727 the property became a bone of contention between various claimants. Eventually the Courts decided in favour of his widow, who was to hold the house and land for life. After the Chaveneys died out the house was eventually sold to Edward Farnham in 1815. In "Quorndon Records" printed in 1912, the author, George F Farnmam commented "In 1866 Mr Farnham restored the house with very little regard to its ancient character, and what might have been an interesting feature of mediaeval Quorndon has but little to shew of its former importance". However, in 1956, in a closet behind the paneling in the drawing room, there remained the painted figure of a red lion, the coat of arms of the Chaveney family. 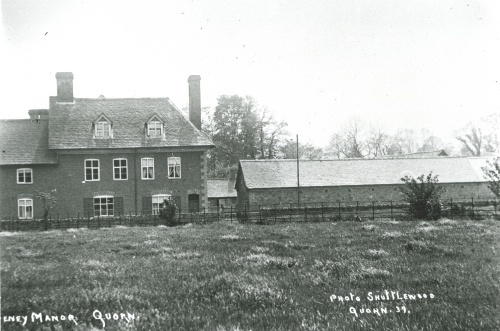 Chaveney House was the last building on this way out of Quorn until the last century. It was probably built in 1415 and the Lord of Beaumanor received a yearly rent of nineteen pence. This photograph was taken in the early 1900s from the field across Meeting Street, where Elms Drive is now.